Kerr Eby. The Whales Back. The Whales Back. 1925. Etching. Giardina 95.iii. 6 1/2 x 12 (sheet 10 x 16). Triap proof, prior to the edition of 90. Illustrated in Fine Prints of the Year, 1927. A rich impression with plate tone printed on cream laid paper. Signed and annotated 'imp' (imprimit) in pencil, indicating a proof printed Eby. $925. The scene is probably Westport or Cos Cob, Connecticut. 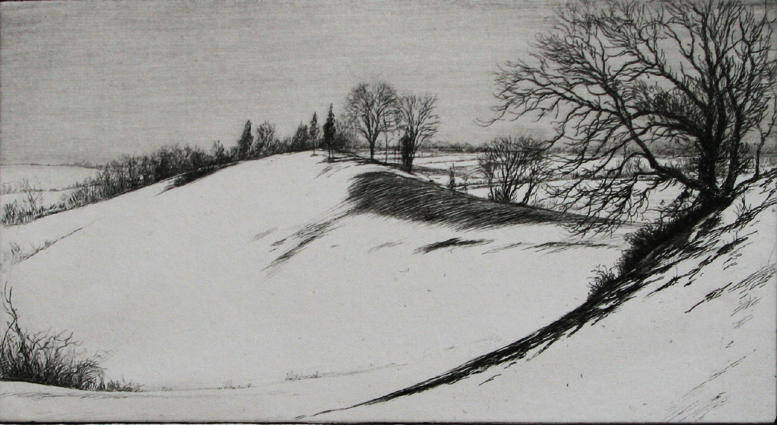 Eby is known for his poetic Connecticut winterscapes.